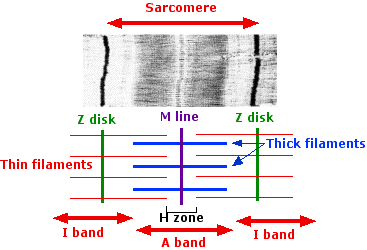 When skeletal (or cardiac) muscle contracts, the thin and thick filaments in each sarcomere slide along each other without their shortening, thickening, or folding. The strength of the relative motion between the thick and thin filaments is determined by the number of cross-bridges that can form between the two. This diagram shows apparatus with which to test the model. An isolated muscle (e.g., the calf muscle of a frog) placed in this apparatus cannot shorten when stimulated by an electric shock. Thus stimulation of the muscle produces an isometric ("same length") contraction. The muscle is placed in the apparatus and stretched to the desired length. It is then given a series of tetanizing shocks to measure its "active" tension; that is, the tension produced when it is stimulated. The strain gauge measures the tension exerted by the muscle. Now let us plot the effect of muscle length on the active tension that is produced. The muscle produces the highest tension when held in the apparatus at the length it normally has in the intact animal. If held at longer (or shorter) lengths, the active tension produced is less. You may conclude from this that nature knows best. And, in fact she does. If a muscle is surgically reattached to an animal so that its length is changed, the muscle gradually adapts to its new length and, after a few weeks, is able to exert its maximum isometric contractions at the new length. A muscle stretched beyond its normal length has less overlap between the thick and thin filaments. Thus fewer cross-bridges can form to slide the filaments against each other. In fact, if the muscle is stretched so far that the thin filaments are pulled entirely away from the thick filaments, the muscle exerts no tension at all. As for the effect of holding the muscle at shorter than normal length, the thin filaments extend so far across the sarcomere that they interact with cross-bridges exerting force the opposite way — reducing the tension generated. These electron micrographs (courtesy of Dr. H. E. Huxley) show the pattern of striations in stretched muscle and resting muscle. In the stretched muscle, there is less overlap of the thick and thin filaments. the width of the dark A band remains unchanged. We would not expect this pattern if sarcomere length involved a change in the length of the thick filaments.